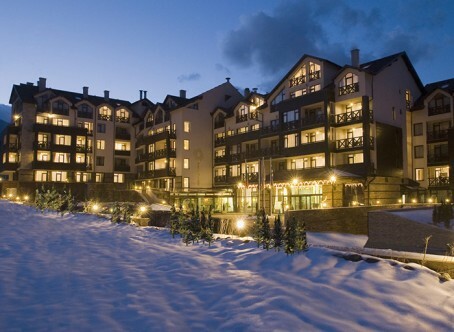 Premier Luxury Mountain Resort is a proud member of Small Luxury Hotels of the World, a 5-star mountain resort in the trendy Bansko, inviting the international traveler to experience high standards of excellence, featuring accommodation of rooms and suites branded by classic elegance. The key elements of PREMIER model of hospitality are the warm and inviting atmosphere and the absolute dedication to service. PREMIER, is located where the foothills of the Pirin Mountains begin to rise; this stylish hotel of 111 deluxe rooms and lavish suites has a distinct residential style and yet in character with the alpine ambiance; an ideal choice for holidays year-round, an exciting retreat for ski and mountain sport fans, a hideaway for romantic breaks, a sanctuary for nature lovers, a supreme accommodation for family holidays, a hotel that is equally appealing to guests looking for a relaxing spa and rejuvenating experience yet also for inspiring and memorable stay. The hotel features a newly renovated spa, powered by Anne Simonin, including 7 treatment rooms, saunas and steam baths. The guest in PREMIER discovers the easy way to keep in shape and unwind while travelling with unlimited free access to spa relaxation area with indoor pool and to the Fitness Room with the latest in sports equipment. Also private treatment suites are designed for complete privacy and ultimate comfort and rejuvenation. The alluring AMVROSIA restaurant, with its gold and green colors, offers modern gourmet cuisine highlighting on meat ingredients and is open for dinner with à la carte and wide prix fixe menu choices.In preparing our gourmet-quality dishes, we use only the freshest possible ingredients and all our meat portions are center-cut in our very own butcher shop. The intimate NECTAR, known for its eclectic décor and leather couches, offers sophisticated cocktails, an extensive curated wine and champagne list, along with a refined afternoon tea and coffee assortments. Marvelous meals, delicious desserts, are served creating NECTAR an all–day menu of delights. Start your day with a complimentary beverage from the in-room stocked coffee and tea private station, enjoy a lavish breakfast buffet or order a full breakfast from a 24h room service. Stay connected for free, any time of day, thanks to Wi-Fi and High Speed Internet Access, or simply relax and catch a movie on the television with cable channels. After a day with friends, family or business, wash up with branded bath amenities and cosmetic set , wear your bathrobe and slippers to settle into the signature LE SPA and unwind with free access to the wellness area with the indoor pool, Jacuzzi, steam bath and various types of saunas, or use the PREMIER 24hour fitness center.Alternatively, relax in comfortable beds topped with crisp white cotton sheets, a duvet, and plush pillows for a restful night’s sleep. Smart Club rooms feature safe lock card key system, individual climate control, double or twin bed, mini bar, coffee and tea making facilities, comfortable lounge chair and table, as well as modern bathroom with hairdryer, magnifying mirror, shower or bathtub. Spacious one bedroom suite with modern décor. A foyer leading to a sitting area furnished with a sofa, armchairs and tea table in a soothing natural palette. Suites have balconies or patios, with beautiful views to Pirin mountain. Occupancy: 2 adults & 1 adult or 2 children in a sofa bed. Executive Suite Nicely appointed suites with welcoming, residential ambience; offering modern day comfort, enjoying views of the hotel surrounding areas and partial views of the city of Bansko. The master bedroom features a private balcony and an en-suite bathroom with wash-hand basin and shower cabin; while the second bathroom can be accessible from both bedrooms and features a deep soak bathtub. The guests will appreciate the relaxation of the two bedrooms, separated from the living room for added comfort and convenience. Maximum occupancy: 4 adults or 2 adults & 2 children .